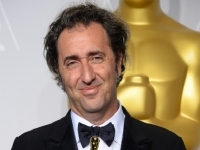 Italian Filmmaker Paolo Sorrentino will receive this year's Cologne Film Prize, a lifetime achievement honor handed out by the German city, on the closing night of the Cologne Conference on October 1, 2015. The crowning achievements of his 2013/14 season were the Oscar for Best Foreign Language Film and the European Film Award for his tribute to Rome, "La Grande Bellezza." His films always revolve around issues such as the repercussions of fame with "Cheyenne" and "This Must Be the Place", the mechanics of power with "Il Divo", and growing old with "Youth". Sponsored by Film- und Medienstiftung NRW and the City of Cologne, the Film Award Cologne honors one-of-a-kind filmmakers in recognition of their contributions to an enhanced language of film and media. Previous winners of the Cologne Film Prize include David Lynch, Lars von Trier, Francois Ozon and the Dardenne brothers. The award comes with a $28,000 (€25,000) cash bursary. At the Press Conference, Paolo Sorrentino said : "I wanted to look at what's hidden behind the apparent impoverishment of our country"